It’s midway through the week and the sun finally came out to show it’s pretty face today! Finally! 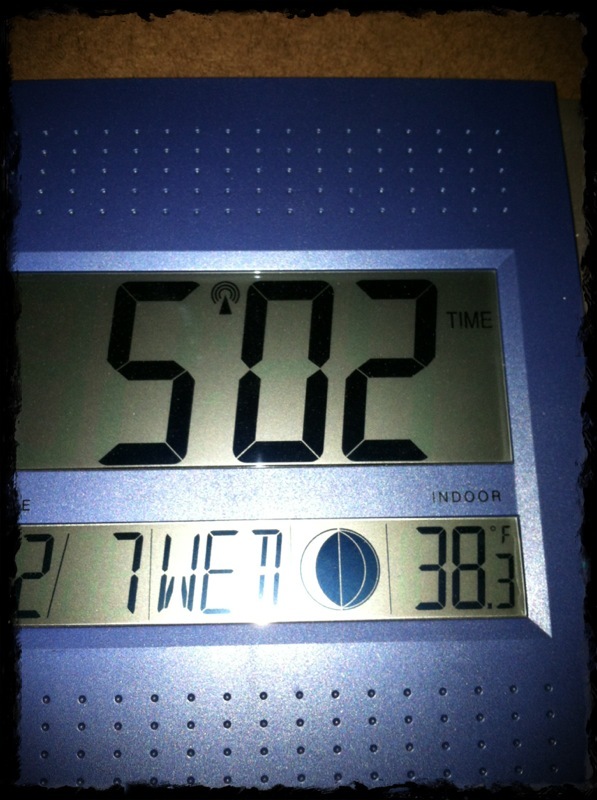 It was a balmy 25° outside and the box inside was good degree warmer coming in at 38° – WOOOO! So cold and not fun. But at the BOOM Box we warmed up rather quickly. After our warm up, we followed up with more warm up on the rowers. 3 sets of 250M row to get the blood circulating. 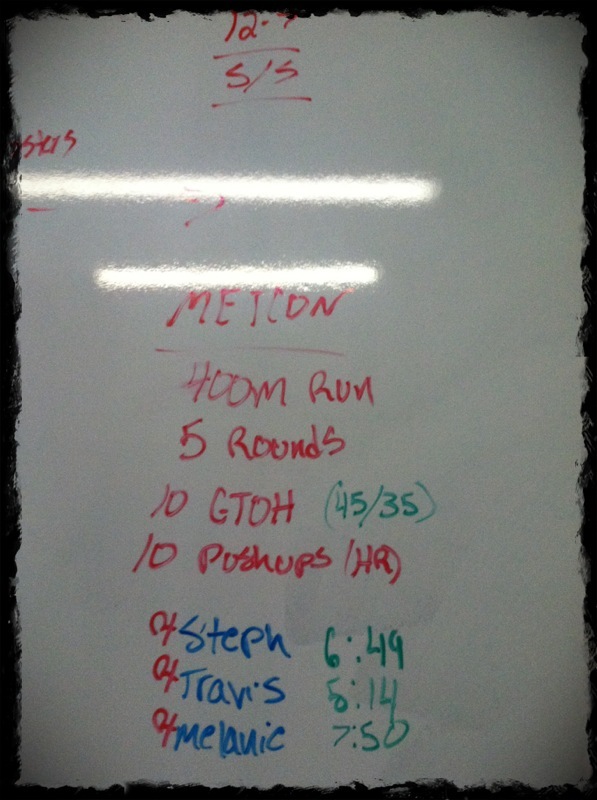 We then proceeded to KB thrusters. I’m thinking they were 24lb kettle bells but I honestly have blanked 3 sets of 8. 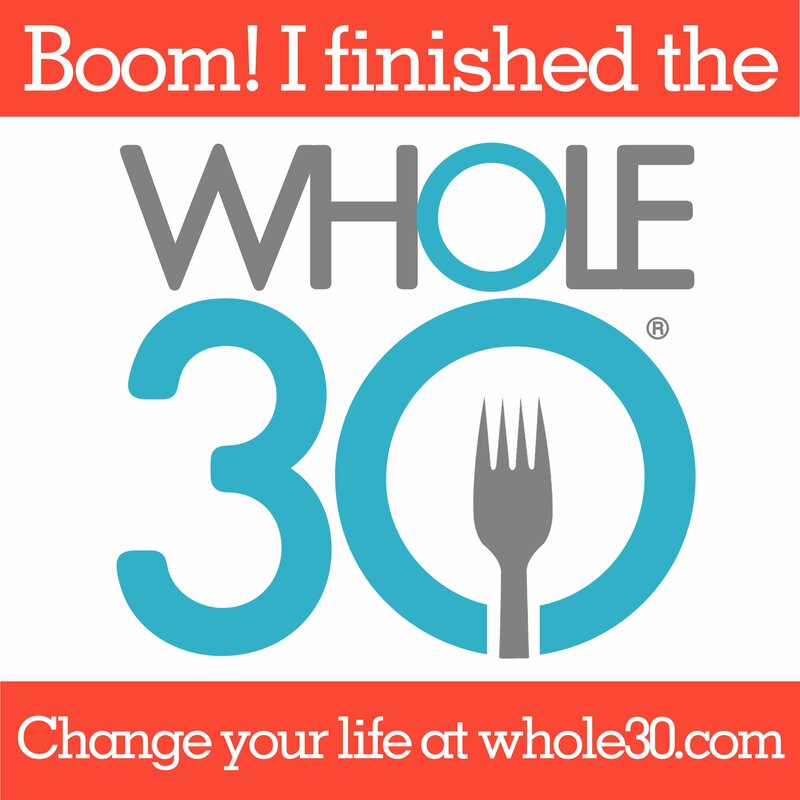 A little tougher than I had anticipated but mission accomplished! All this time I’d been staring at the MetCon on the board wondering what weight I would be doing for the Ground to Overhead (GTOH) and thinking the bar will be cold, and just so many random thoughts. Come to find out the GTOH is with a plate. Wow easy enough I thought! Hehe, I wish I wouldn’t have those “easy” thoughts! It is a shoulder burnout then add HR pushups to that! Woooo, It was a good, quick and intense knock you out kind of workout. As you can see in the picture I finished at 6:49. Not bad. I flew the first 2 rounds, then kind of lost all hope after that. Thankfully we only had to do a “buy-in” 400 m run at the start because the air was chilly outside. This isn’t my first time to make this dish but of course now that I’ve begun my blogging adventure I will share with you my meal. I don’t have anyone to give true credit to because I’ve just really looked at pictures and got the general idea. I did read somewhere and I feel bad that I don’t recall where I read it that you should let your zucchini dry out some after you slice it up. So leave it on the counter top for 15-20 minutes or put it in the fridge for a few hours (for me it was overnight). This will make more sense in just a few moments. 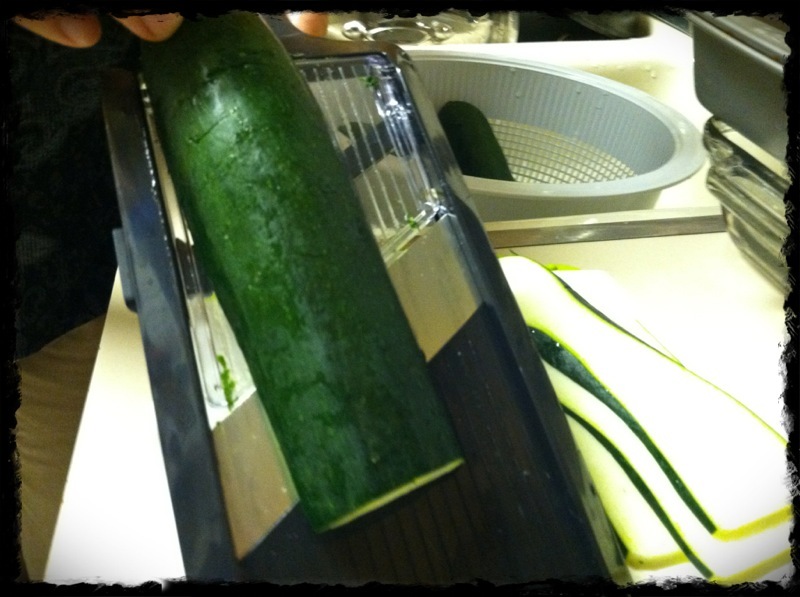 Tuesday night I decided I would prep the zucchini. 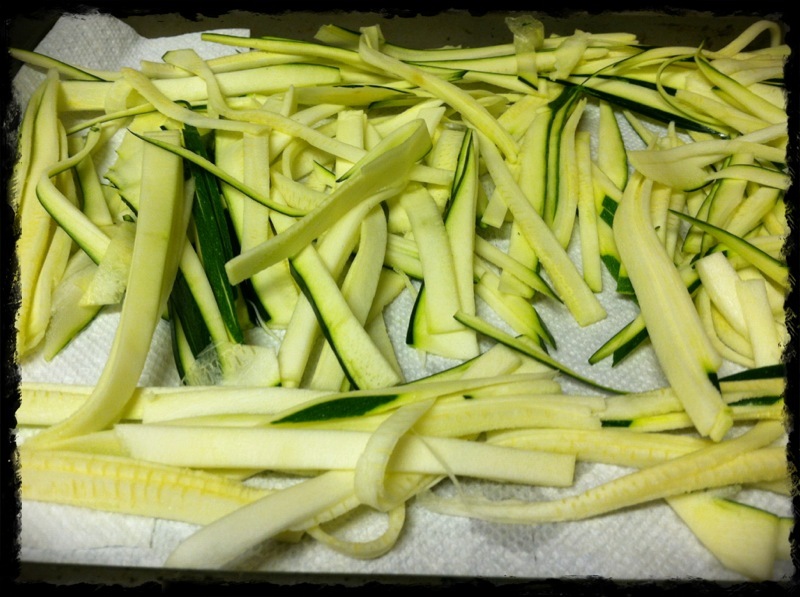 I rinsed off about 8 zucchini’s and cut the ends off of each of them. I then slice them in half. I use a mandolin slicer to make thin strips but I’ve just sliced them thinly as well without the slicer so whichever you prefer. After you have then strips I cut them into even thinner strips. Depending on preference you could have thin or thick “faux” noodles. As mentioned above, I lay them out to dry. I line a cookie sheet with paper towels and lay the zucchini strips on there and for me it is best to keep them in fridge until I was ready to use them last night. We buy grass fed beef and I used a little over 1.5 lbs for this meal. I brown it over medium heat with some salt, pepper and cumin. 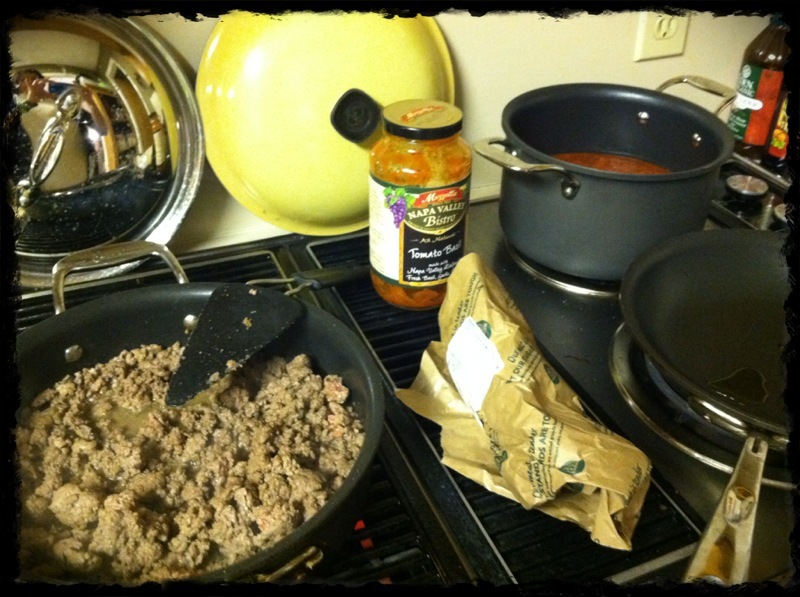 I don’t have the time or patience to make a “homemade” sauce so I go with what looks good at the store. And not only what looks good but what is CHEAP(er). So I found an organic, natural sauce and I get that warming up. 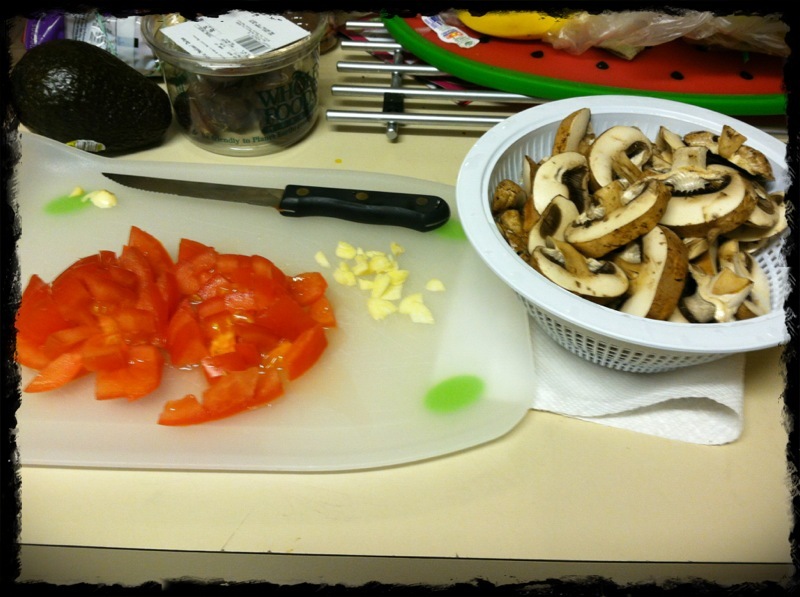 While meat is browning and sauce is simmering, I sauteed up some fresh tomato, garlic and mushrooms that I will add to sauce. Once the beef is good I add the beef and veggies to the pasta sauce and let it simmer all together. It’s time to get some olive oil in a pan. 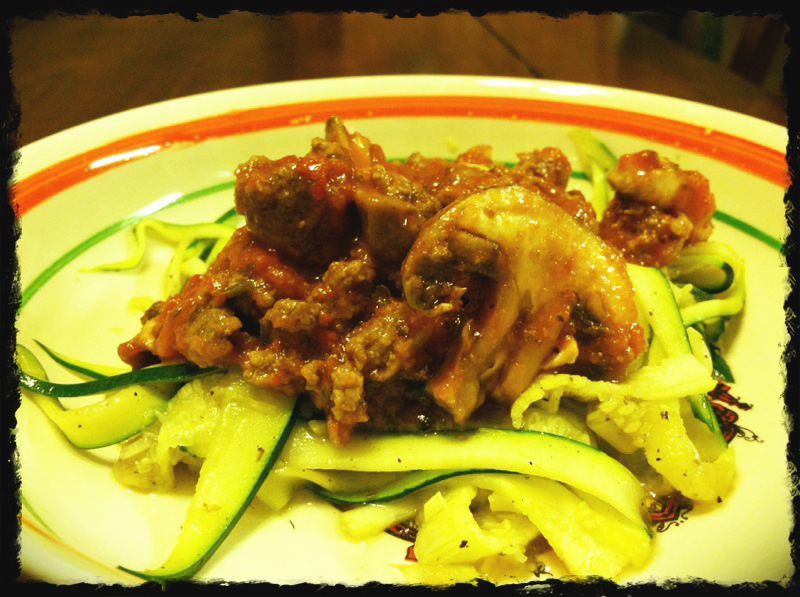 I sauteed some chopped up garlic then added the zucchini. 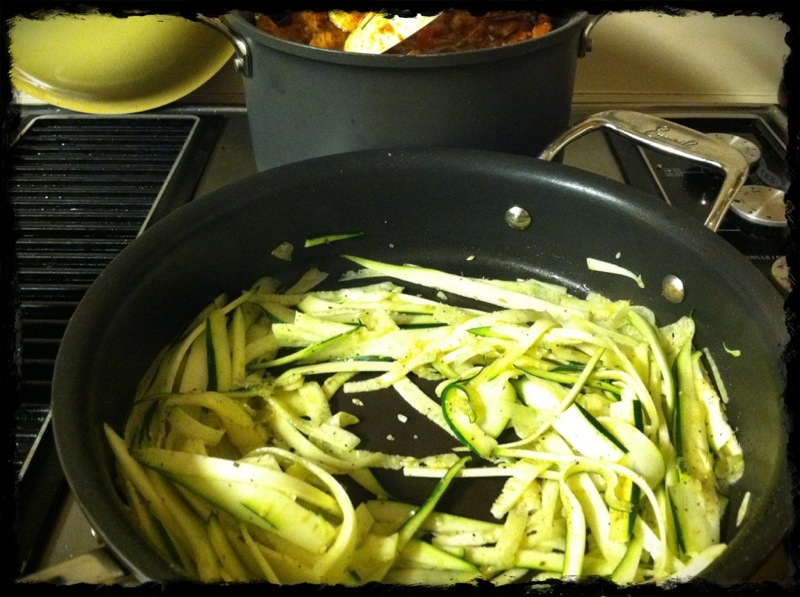 I season the zucchini with ground thyme, oregano, salt and pepper. 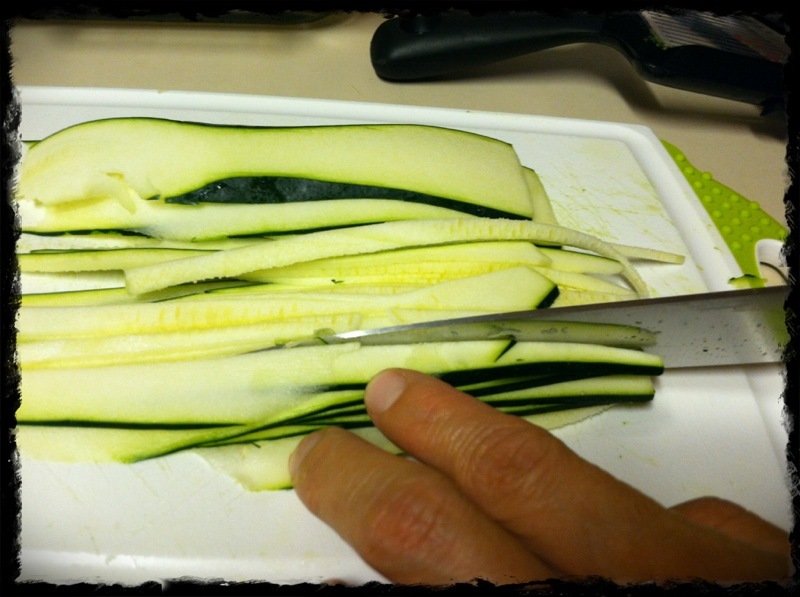 The zucchini softens pretty quickly and only takes a few minutes before it’s ready. 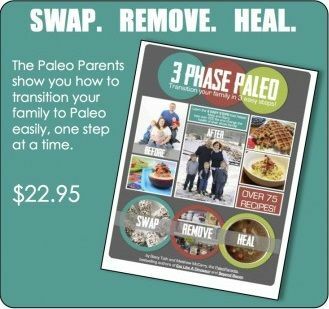 So plate, spoon out some sauce and you’re good to go.